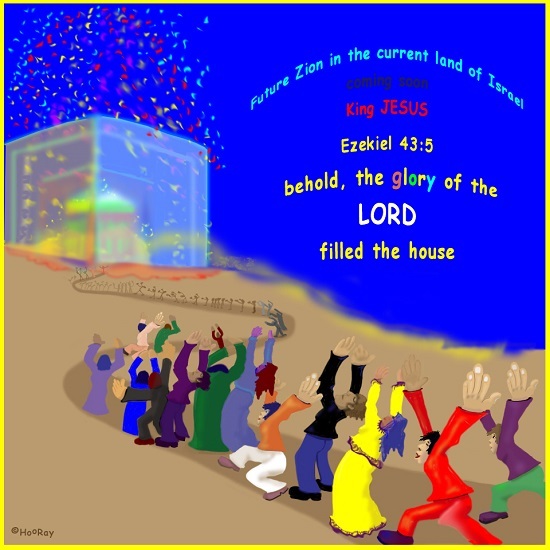 The glory of the lord appears to Zeke in the temple, and declares that it will be the place of his throne and where he will live forever among the people of Israel (v 7). That’s just more fuel for the fires that battle for occupancy in the Middle East. And also note (from the picture) that Christians see Jesus in this prophesy – of course; they see Jesus in everything. Then we’re back to the measurements… yawn. But after the specs for the altar, we get a lengthy description of how and where the blood sacrifices are to be made (v 17-27) – basically a recap of all the ‘god loves the smell of burning fat’ stuff from Leviticus. That was ages ago, but it seems the old rules still apply, and the Israelites haven’t progressed much toward civilization – at least not in this area. We begin with rules about the east gate – it’s special and must never be used again because god used it, so that makes it holy. Or something like that. Then there are rules about who is allowed where – and of course, it goes without saying that no foreigners or non-Jews will ever be allowed in the sanctuary (v 6-9). Contamination! The horror! There are rules about who can be priests. And what to wear. And where to change clothing. And how to do your hair. And ritual cleanliness. Etc etc. All just a brief rehash of the old Levitical laws. How to measure and divide the land around the temple. And then finally (!) some good stuff in v 9-10: advice about how to stop violence and oppression, and to stop cheating people, and to use only honest weights and measures (like the homer, the ephath, the shekel, and the gerah – remember these in case you’re ever on Jeopardy!). Then we get to the offerings and festivals – I covered all this long ago, and I’m not going there again. We learn the rules for use of the gates, and it’s no surprise that they are different for the elite than for the riff-raff. Some of them are actually kind of comical. Then we get to ritual offerings… again! In v 16-18 there are some rules about inheritance, which the SAB says have been used by Republicans to justify protecting the rich from taxation; check them out and see what you think. And we conclude with a description of the temple kitchen.